INDUSTRIAL GLOVES: Most of our competitors sale industrial grade gloves. 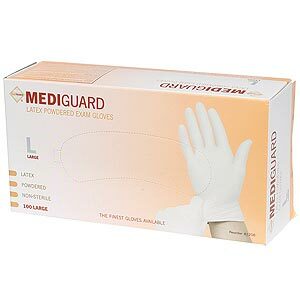 Problems will occur more with Industrial Grade Lightly Powdered Latex Gloves. Often the cheaper the glove the more pin holes and or exposure to Heat and Light, this problem with Industrial Glove Manufacturing Standards breaks down the gloves barrier and causes it to rip or leak. Industrial Grade Gloves have a higher extractable protein content which causes Latex Allergies and are not FDA or ADA approved. STORAGE: In storage avoid excessive heat 40° Celsuis / 104° Fahrenheit. A open box should be sheilded from exposure to direct sun or flourescent lighting and stored in a cool dry place. 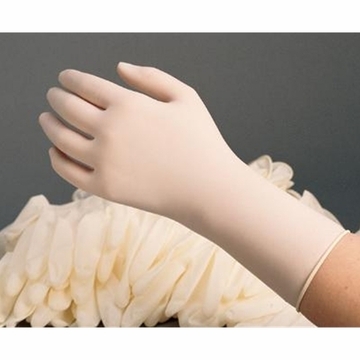 GloveSaver.com Offers our customers a quality brand name Lightly Powdered Latex Exam Glove. We guarantee all Lightly Powdered Latex Exam Gloves for 1 year.. Finally we offer you a 30 day no hassle money back guarantee on all of our products. Protein Rating: Our Lightly Powdered Latex Exam Gloves contain 50 micrograms or less of total water extractable protein per gram. This is a standard rating for Lightly Powdered Latex Exam Gloves and is a benefit to the end user. Less extractable protein will help to not irritate your skin. Shop with GloveSaver.com and see the difference in our certified Lightly Powdered Latex Exam Gloves.